The Lodge features a floor-less run to allow access to grass or to benefit from nail wear on hard surfaces. It has a non-slip ladders (pets feel more secure) and run access door flap. It has a plastic coated wooden floor and a hinged roof for easier access and cleaning. Bargain as its reduced from £95.00 and cheaper than most high street shops! Thanks O.P. This is exactly what I am looking for however I can't seem to see what size it is - can anyone help ? Have a look on eBay too, we bought a very similar one from there for a similar price, possibly a bit cheaper. It's a nice hutch for sure but the price is nothing special. Like sabz says you can find similar hutches for less. IIRC, there's one for about £48 at the petshop just round the corner from my home. Had to vote cold, sorry. Frankly, I'm a bit disappointed that this got hot. Anyone reading this could make their own for about £15 without much effort. Besides, even the biggest ready-made hutches are too small to keep a rabbit in. Just look at the picture and imagine yourself as a rabbit living in there. Should be about 6 to 8 times bigger in my opinion. This hutch is wayyy to small for a Rabbit, would be like you staying in a box room for the rest of your life. The overall height of this hutch doesnt ecen give a rabbit enough space to periscope in. The length should be enough for three bunny hops at least. A Rabbit should have a hutch of at least 6ft x 2ft x 2ft. This hutch is wayyy to small for a Rabbit, would be like you staying in a … This hutch is wayyy to small for a Rabbit, would be like you staying in a box room for the rest of your life.The overall height of this hutch doesnt ecen give a rabbit enough space to periscope in. The length should be enough for three bunny hops at least.A Rabbit should have a hutch of at least 6ft x 2ft x 2ft. We have a similar hutch for our rabbit. I agree it is not that large but not everyone keeps their rabbit caged in all day. Ours has the free reign of the garden all day and only uses the hutch at night. This is for her safety as we have seen a fox in the area. Was going to say, do people really still keep rabbit cooped up in little hutches like this?! Most people I know who have rabbits either have them as house rabbits or a big hutch in the garden with regular use of the whole garden. Saying that I suppose this hutch would be ok for use in a confined garden where the rabbits will be allowed out to run around. to the person who recommends building one for 15 quid... if you can build me an exact replica (including delivery) then the 15 quid is yours. paypal or cash on delivery? I think this is the nicest way to keep rabbits, bit pricey but when the rabbit pops it 's clogs they sell second had for not much less than new, so a much better investment. Yes, Rabbits can be toilet trained, my two use their litter tray. 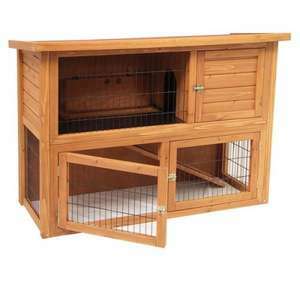 This is too small for a rabbit unless it is attached to a large run and only uses the hutch for sleeping in. A better investment, if you have space, is to buy a shed for around £100. It makes me cross to see some of the tiny boxes sold as suitable for rabbits. Minimum RSPCA recommendation is 6ftx2ftx2ft, as another poster said. Also, plastic floor in this is not ideal. You can litter train rabbits pretty easily. Look on Rabits United web site for info about rabbit stuff. Our rabbit is toilet trained even though she lives outside - she just goes in a litter tray - nice and easy to clean out every day. She does come in the house for a bit of exercise when it's too cold to let her outside in the winter and so far she hasn't yet done anything in the house. I vote 'freezing cold' for this hutch as it's far too small for a rabbit - pet shops should not be allowed to sell hutches like these it's inhumane. A rabbit should be able to stand upright on it's back paws and have enough space to move and exercise freely. How would you feel cramped up in a box all your life? Horrid horrid little hutch. It should be illegal to keep an animal in something so small. When we got our first rabbit, we were pretty clueless and just bought one of the starter hutches and runs from Focus. Soon enough we got her a playmate, and it was pretty clear that the space they had was completely inadequate. Yes, we let them have the run of the garden when the weather allowed for it, but with short summers and long winters, rabbits need lots of safe space to just do their own thing unsupervised. So, we had a guy that made aviaries knock something up specifically for our bunnies. The run's 12ft long x 6ft 6in wide, and over 6ft tall, so comfortably big enough to walk in. The hutch is the full width of the run, and on two floors. It originally had a felt roof over the whole run, but I modified it to cover just half as it was blocking off too much light. It cost us £400, and to be honest is one of the best purchases we've ever made. A few playmates have been and sadly gone over the years, but the two original bunnies are now both 10, and still going strong. I'd like to think that the space and freedom their house has given them has contributed to that. For me, it's all about the size of the run the bunny has access to. I've heard and read about countless people saying that yeah, but we get the bunny out and let them run around the garden, but bunnies need constant access to space, not just the times that are convenient for the owners to get them out. Don't forget, they're crepuscular (most active at dawn and sunset), so unless you're getting up at the crack of dawn to let them out, being cooped up first thing and last thing goes against their natural instincts. I've just nipped out to give our rabbits a sly carrot each before I go to bed, and they're running around, playing - happy as Larry. Same every night. Couldn't imagine them just being stuck in a little hutch at this hour. The fact that this product refers to that thing at the bottom as a "run" tells me everything I need to know about the company that makes them. If this was inside a 10ft run, with that bottom door permanently open or even removed, then that'd be one thing. I suspect that most people buying it would assume that it would be all the housing their rabbit needs though, and that's just sad, frankly. Inevitably with all this in mind, cold. I keep ladybirds, I have two at the minute, Billy and Molly. This hutch looks ideal for them, plenty of space, voted hot, many thanks! I keep ladybirds, I have two at the minute, Billy and Molly. This hutch … I keep ladybirds, I have two at the minute, Billy and Molly. This hutch looks ideal for them, plenty of space, voted hot, many thanks!